At Weddington Primary School, we have been working hard to make the school an outstanding place to learn. Word of our efforts and the improvements we are making has been buzzing around at important meetings. 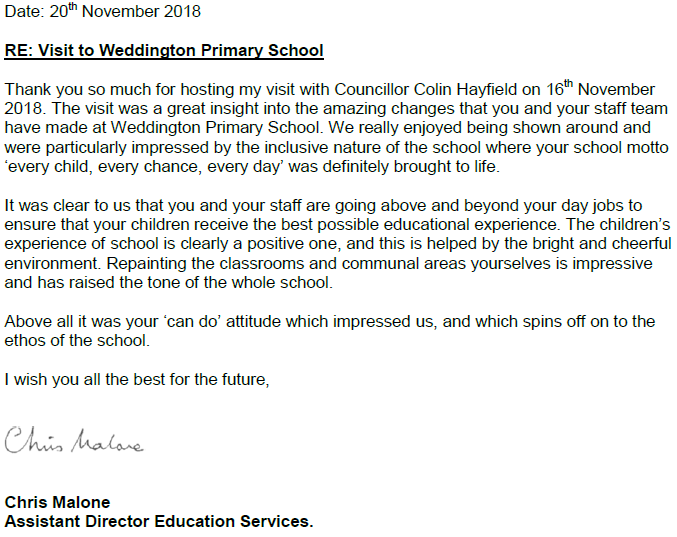 Due to this, Chris Malone and Colin Hayfield we eager to see our amazing school and we had the honour of welcoming them on the 16th November. They were incredibly impressed by everything they saw on their visit and Chris Malone sent us this lovely message of thanks that we wanted to share with you.